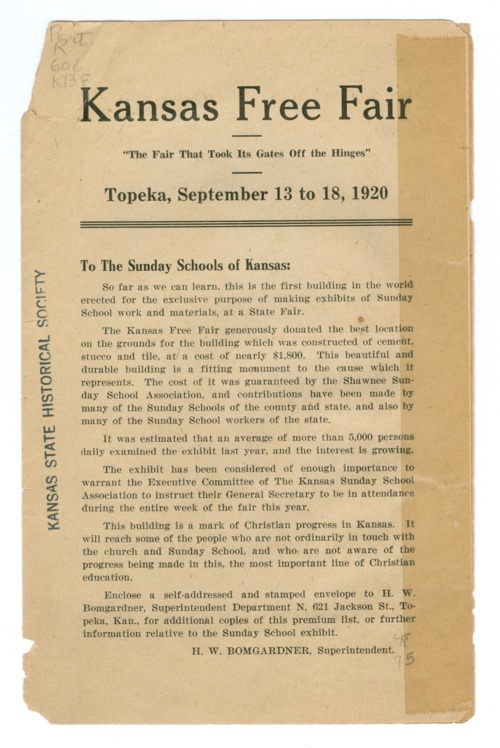 This pamphlet provides the information about Sunday School exhibits that are part of the Kansas Free Fair. Fair Superintendent H. W. Bomgardner writes that the fair has provided ground for a building that was built to be used for the Sunday School exhibits. The building cost $1,800 and was constructed of cement, stucco, and tile. Bomgardner believes that this is the "first building in the world erected for the exclusive purpose of making exhibits of Sunday School work and materials, at a State Fair." The flyer contains the rules, the categories for exhibits, and the prizes for each category. Kansas Free Fair "To The Sunday Schools of Kansas"